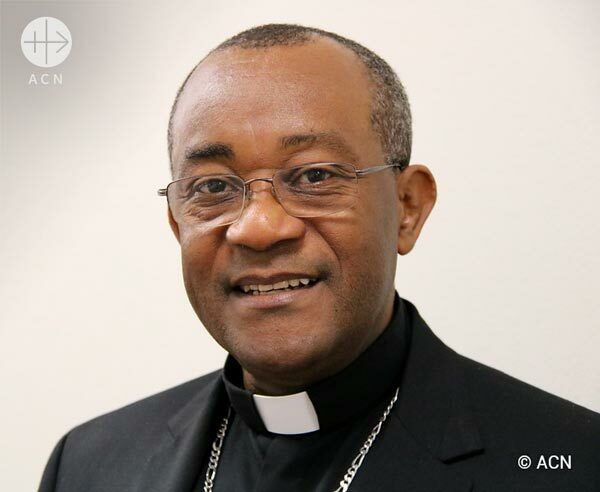 Interview with Mgr Launay SATURNÉ, Archbishop of Cap-Haïtien since 23 September this year and president of the Haitian Bishops’ Conference, during his visit to the international headquarters of the international Catholic pastoral charity and Pontifical Foundation Aid to the Church in Need (ACN). Mgr. Launay Saturné, Archbishop of Cap-Haitien, Haiti and president of the Haitian Bishop´s Conference. His country, which was struck once again by an earthquake this October, is also plagued internally by cases of corruption extending to the highest levels of the state. On Monday, 22 October President Jovenel Moïse sacked two members of his cabinet, including the Chief of Cabinet (akin to a Prime Minister) due to involvement in scandals for their own personal enrichment. The vast majority of the 11.5 million inhabitants of Haiti regard themselves as Christians and Catholics, with only 2.7% agnostics and 2.7% animists.These figures however by no means reflect the complexity of the religious picture, in which the influence of voodoo is a powerful force within society. How did the bishops react to the recent cases of corruption which have convulsed the country? The Catholic hierarchy in Haiti, including the Haitian bishops’ conference, has always accompanied the people, both in their faith and in their daily struggle for human dignity. The reaction of the bishops should be seen in this context. In an official statement, the bishops have publicly denounced the corruption, because it is a scourge, an evil in society. I quote: “It tends to become widespread in society, to develop into a system and it causes damage that is difficult to repair. This situation is nothing new, but this time it has reached a level and a scale that are unacceptable and unsustainable.” We have observed a positive reaction within society in the face of this scandal. “What is very interesting is that this scandal is causing a collective awareness that is strong and healthy. The people are demanding justice with one voice, fully aware that corruption is a radical evil which endangers their collective future.” Everything appears to indicate that funds intended for development, for bringing growth to the country and freeing us a little from the poverty of every kind, has instead been misused and misappropriated. Everyone knows just how useful this money would have been for the reconstruction of our country and for improving the socio-economic conditions of our people. As bishops and pastors we must walk together with the people of God, who have been entrusted to our fatherly and pastoral care. What steps is the Catholic Church in Haiti taking in this context? The Church must always remain faithful to her Divine Founder. It is by means of this fidelity that we can continue to grow in love and hope, as the Gospel tells us to. In this context our first action as the hierarchy of the Church is to continue walking with the people as we must do as their shepherds. In addition, we must help the people to become better educated in the social teaching of the Church, so that they can be more aware of its role and implication in the responsible management of public life for the good of all. Finally, the preaching of the Gospel is intrinsically a form of leaven that can change hearts and situations from within, like the yeast in the dough in St Matthew’s Gospel (13:33). All this is part and parcel of the overall plan of evangelization, education and formation, which the Church seeks to place at the disposal of all believers, in order to train and motivate them to assume their responsibilities within society and within the country. But all of this has to take place first of all within the family and in the schools. These places are extremely important to us. Over and above the intellectual formation, the family and the school have to inculcate in children and young people the love of God, love of neighbour, love of country, respect for the common good, civic responsibility and patriotism. For the Church, education is a most urgent priority, as a result of which is the parish school, in which the Church can distribute the “bread of education” to the most disadvantaged children in the remotest areas of the country, where the State is absent. A great many priests and bishops have emerged from these schools – to which we should also add the schools run by the religious communities, which have a reputation of being the best in the country, and which are indeed the best. To tell the truth, we are making up for many of the deficiencies of the State, both in this and in many other areas. At the same time we are engaged in many one-off programs to help our fellow citizens in difficulty. This is exactly what we have been doing for the victims of the recent earthquake on 6 and 7 October this year, helping to rebuild their homes and recover their psychological equilibrium. The archdiocese of Cap-Haïtien owns over 80 hectares of good agricultural land, which we want to use in an environmentally friendly manner, in the spirit of the encyclical Laudato si’ of Pope Francis. The students at the faculty of agronomy at the UDERS in Cap-Haitien (a branch of the Université de Notre Dame de Haití) can carry out some important experimentational work there. Additionally, working this land can help to reduce unemployment, increase local production and persuade workers to stay at home and work to earn a living. The borehole we have on one of these pieces of land can provide water and this means that we have every possibility of success on our side. Our Holy Father, Pope Francis writes in his encyclical Laudato si’ that we must combat poverty via the protection of the environment. This is what we literally intend to do. Do you have good relations with members of the other Christian groups? We have good relations with Haitians of all Christian confessions. For some time now we have been accustomed to working together with them, and our relationship is based on the important values we share. This is particularly evident in the ecological field, because we share the same environment, and here we are all affected. Inspired by the publication of the encyclical Laudato si’, we organised a ceremony which brought together representatives of the Protestant communities, atheists and followers of voodoo. Ecology has no religion, it concerns us all! Environmental problems frequently affect us here in Haiti and are a wake-up call. Our country is very vulnerable to natural disasters. However, I refuse to hear it called a cursed country. The Lord gave the earth to the children of Adam to till and cultivate it. Our happiness comes from something beyond, originating in the loving heart of the Creator. Geography alone cannot determine our happiness or unhappiness. On the contrary, we see ourselves as children blessed and loved by God. 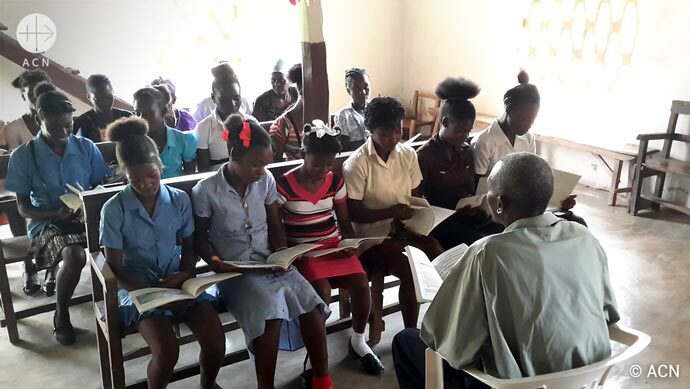 What is the situation of the Church in Haiti? We are a people who practise our faith. The churches are full and the clergy accompany people to help them live a Christian life and live their faith on a daily basis. We are fortunate in having many vocations. In our major national interdiocesan seminary we have 102 students in philosophy and 182 in theology. 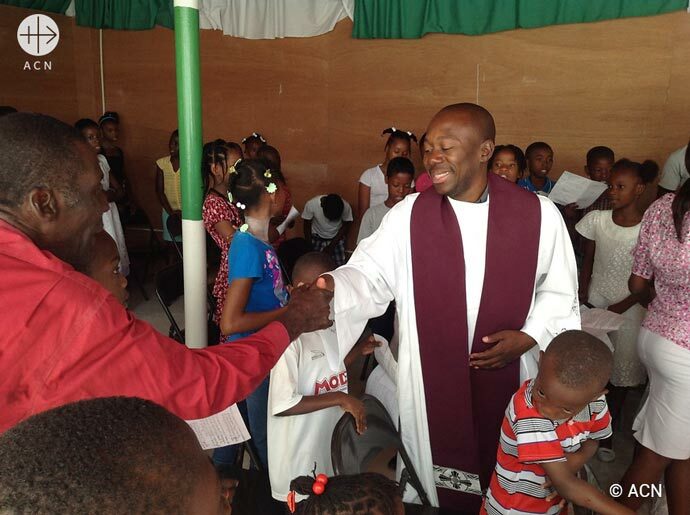 The future of the Church in Haiti, in terms of human resources, is well assured. The bishops of Haiti and the seminary formators are accompanying the seminarians and helping them to develop into priests who will work in harmony with the heart of God. The earthquake of 2010 destroyed the two buildings of the major seminary of Notre Dame of Haiti. Today the bishops are still seeking funds for the reconstruction of this national major seminary, all together in one place, which will cost 9 million dollars. We are seeking economic aid from various organisations and sister churches, episcopal conferences and dioceses, here and elsewhere, in order to make possible this project, which is currently one of the principal and most urgent priorities of the Church in Haiti. We still need 3 million dollars in order to be able to begin work on rebuilding this formation centre in 2019 – the project which the Haitian Bishops’ Conference regards as the first priority. Would you like to say a few words to the benefactors of ACN? Thank you, of course! Thank you for your donations, but thank you also for the visit by the representatives of ACN to Haiti, and to my archdiocese, to help us rebuild what was destroyed by the earthquake of 2010. We pray every day for the physical and spiritual health of the benefactors of ACN and for those working in your foundation. The reconstruction has still not been finalised and meanwhile, new misfortunes have befallen us. The Church in Haiti needs loving and generous hearts to support her pastoral and evangelising mission. 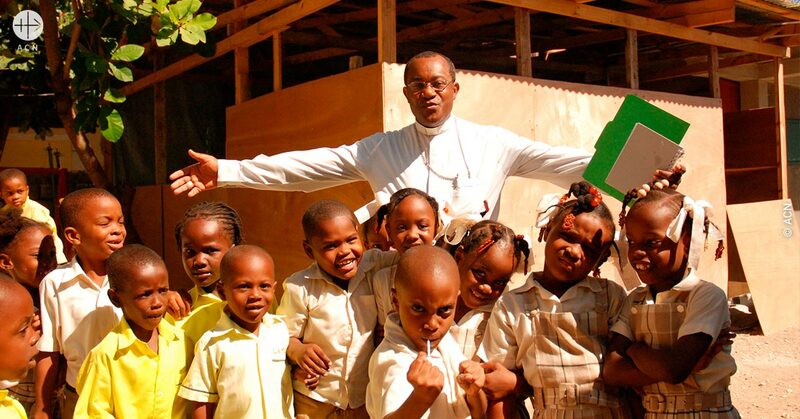 We are most grateful to ACN for your great spiritual closeness and your effective and practical solidarity towards Haiti and the Church here.